"Many student borrowers struggled to answer basic questions about student loan repayment," the group said. 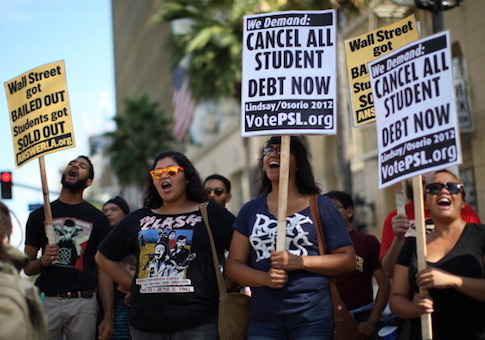 "Expectations are not clear when it comes to student loan repayment." The ignorance displayed by the 500 respondents is striking given the magnitude of the student loan market, which is nearly entirely backed by federal taxpayers. MPF said borrowers unaware of the loans they are taking out give student lending a "characteristically shady outlook." College students and graduates have taken out more than $1.5 trillion to pay for their educations and the default rate—failure to make a payment in 270 days—on such loans stood at 11.4 percent in 2014, according to the most recent Department of Education data available. The default rate on student loans is on par with the 11.53 percent rate on mortgages that occurred at the height of the Great Recession. While other default rates have improved along with the economy, student loan failures have only increased. Prof. Richard Vedder, an economist at Ohio University who specializes in the education market, said student loans were "the exception" in delinquency rates as home and automotive defaults improved. "Student loans are the exceptions and they haven't had the fall off [in default] that other forms of lending have in part because students feel they can get away with non-repayment," Vedder said. Vedder does not blame students alone for their ignorance of loan terms. He points to the increased pressure on young people to go to college, as well as the depreciation of the four-year diploma as a salary metric in recent years. A bachelor's degree once indicated to employers that a job candidate was worthy of higher pay. As more people have gained the credential its value has decreased, while a number of jobs traditionally held by high school graduates, dropouts, or vocational school have seen hikes in income, especially in the energy sector. "There has been a large number of people who have borrowed an awful lot of money at a time when the gains of a college degree have stabilized or declined in relation to other forms of certification or competency," he said. "The perceived rate of return on a college diploma has declined." Vedder said borrowers were not mistaken to assume the availability of loan forgiveness given its expansion during the Obama era. President Obama created a program to cut loan repayment for those who paid their debts over 10 years, while also holding a public sector or nonprofit job. Vedder said such a trend is not sustainable, however. "It isn't entirely irrational for students to think the way they have because federal service and public service forgiveness grew," he said. "It's bad public policy to throw those forgiveness options out there because it almost invites non-repayment on loans, particularly given the magnitude of the debt." Loan forgiveness may not be as attainable as borrowers imagine even under the Obama-era rules. More than 611,000 public servants were able to have their loans forgiven; however, the administration rejected nearly 500,000 applications to the program. Vedder said borrowers are in for a rude awakening if the United States does not adapt to the marketplace and provide students and prospective borrowers with adequate information about the value of a college diploma as compared to a vocational degree or career. The key will be dismantling the myth that a college diploma automatically confers a larger paycheck to graduates, especially when dropouts are saddled with debt because student loans cannot be discharged in bankruptcy. "There is a deplorable lack of information about financing college education," he said. "We should start providing information in high school that going to college is going to confer some benefits … but these risks are not inconsequential."